Let’s Create! 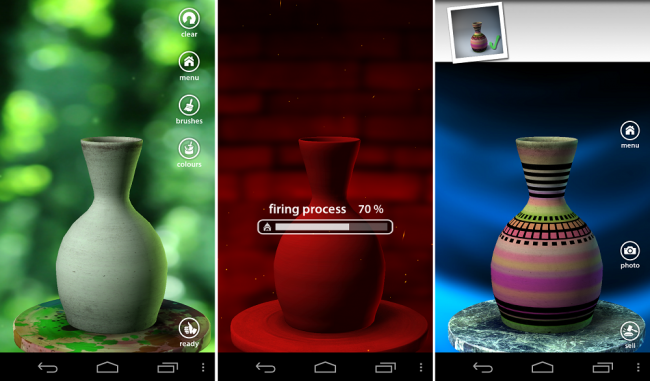 Pottery – A Pottery App That Is Cool? I know it may be hard to believe, but maybe making pottery can actually be cool. Let’s Create! Pottery is on Google Play and once we saw all of the awesome ratings, we figured we should give it a shot. To our amazement, the game is actually a lot of fun and definitely lets you play with your imagination while also making pretty vases. Once you make your shape, you place it in the kiln for firing, paint and pattern it, then you can choose to place it for sale. With the money earned from the sales of your work, you can buy new paint colors, patterns and materials to work with. The pro version is a ridiculous $5, but for some, that could be worth it. Give the game a go and let us know what you think.